Heriot-Watt University digital asset management system and request-based public image image library. Founded in 1821, Heriot-Watt has a rich heritage and an established reputation as a leading research-led university and provider of education around the world. They use their iBase system both to manage their large collection of media and to make images available to students and external users on a per-request basis. The system has an upload / management back-end and a publicy-available front-end, with the ability to specify which of the images in the system should be available to user on the public front-end. 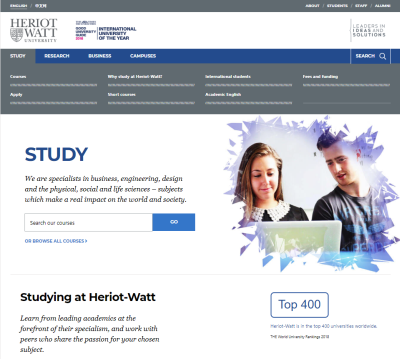 In addition, the front-end is customised to match the branding of the existing Heriot-Watt website, and to provide specific functionality requested by the client. Branded to match existing web site.